VATICAN CITY (CNS) -- Although bishops should make up the majority of voting members at a Synod of Bishops, the fact that the body is only consultative means women should be included as full members just as priests and religious brothers are, said three priests who are voting members. Why can’t women vote at the Synod on Young People? The superiors general of the Dominicans, the Jesuits and the Conventual Franciscans -- all priests who are voting members of the synod -- spoke to reporters at a Vatican briefing Oct. 15. When the men's Union of Superiors General chose two religious brothers to be among their 10 voting delegates at the Synod of Bishops, they consciously made the choice to emphasize that men's religious orders include both priests and laymen, the minister general of the Conventual Franciscans said. "Obviously it wasn't an accident" that two brothers were elected, Father Marco Tasca, the minister general, told Catholic News Service after the briefing. "Consecrated life is made up of priests and laypeople, so it is only right that there also be lay superiors general at the synod." When the superiors elected a brother to the 2015 synod, he said, "there were some doubts about whether or not the synod office would accept him, but the pope intervened and said, 'Let him come.' Case closed. "Consecrated life is made up of priests and laypeople, so it is only right that there also be lay superiors general at the synod." "This time we didn't ask," Father Tasca said. Now, he said, that choice "should raise the question of the presence of the sisters, the women. That is the great challenge." The men's USG and the women's International Union of Superiors General are now asking that question together, Father Tasca said. "We had a meeting last week -- a small group of superiors from both -- and we asked, 'How can we move on this together?'" The two organizations of superiors, which hold a joint meeting each November, will get together again, he said, to try to move the question forward. "I think the correct path is to present this together, not 'we men' or 'we women' like children, but together." While rules for the Synod of Bishops provide for the men's union of superiors to elect 10 voting members for the synod, there is no such provision for the women's union of superiors. However, the pope does appoint women religious as observers or experts to the synods. Several questions at the synod briefing Oct. 15 regarded the presence of women and their lack of a vote. The synod rules allow for "representatives" of religious life to participate, and they should be both men and women, Father Bruno Cadore, said. "It's a Synod of Bishops," said Father Bruno Cadore, master of the Dominican order. But, he said, the synod rules allow for "representatives" of religious life to participate, and they should be both men and women. "You know," he said, "that 80 percent of consecrated people in the church are women?" Because the synod "is not a deliberative body, so it is not tied to priestly ordination, I think in the future there will be a Synod of Bishops that says, 'We want the participation of those who collaborate with us in pastoral work and, for this reason, we will invite representatives of consecrated life,' knowing that -- as I said -- 80 percent of them are women. This should happen." In fact, he said, with this synod focused on "young people, the faith and vocational discernment," it would have made sense to have more women religious participating, given their work in the field of education, faith formation and vocational promotion. Father Arturo Sosa, superior general of the Jesuits, said he agreed with Father Cadore that "it is a Synod of Bishops," but he also said he sees an effort by Pope Francis to "deepen the synodality of the church" and strengthen the vision of the church as "the people of God" by ensuring that men and women are treated equally and have an equal voice. "I think this will help us move forward," Father Sosa said. 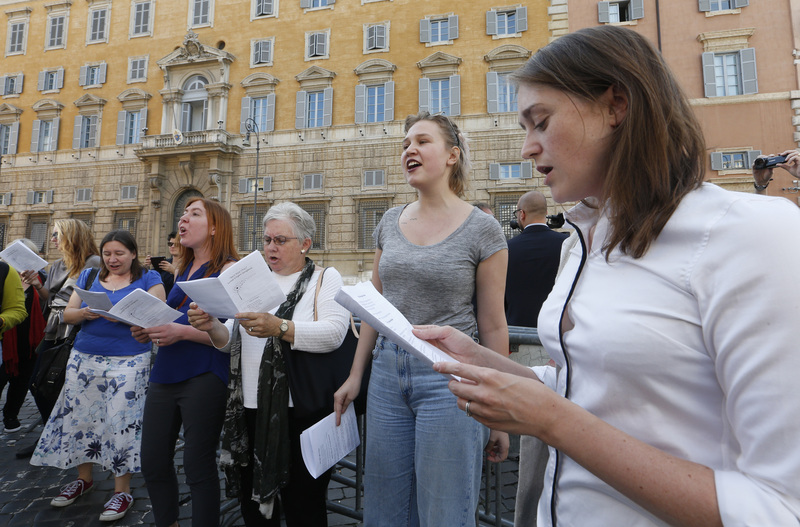 The repeated questions about women's participation and an international petition calling on the pope to give women a vote at the synod signify "discomfort, which is a sign that something's wrong," he said. "So one must listen and move forward." Bishops are signs and representatives of the Church's unity. The Synod of Bishops is an expression of their collegiality. Neither of which preclude active collaboration with non-Bishops (laity, women, Religious) but rather, would only be enhanced by it. We are aiming for a synodal Church, not a tiny nod to the most blatantly snubbed and insulted group in the Church (Women Religious Superiors represent some of Jesus' brightest and most prophetic disciples). Perestroika in the church is best served through the active participation of all stake holders. born in 1962 who grew up after the many changes borne forth from Vatican II, I appreciate that women now rightfully have a greater role in the life of the Church. As the Synod of Bishops is a consultative body, I strongly favor women having the right to vote. However, I sincerely hope that such a good and necessary move isn't used to undermine authentic Church teaching that the priesthood is reserved to men. Although I say bravo to these priests who are seeking a reason women were given no vote at this synod. It begs the question, why will you not also join in the stand for Justice for women called equally to ordained priesthood by God just as you have been? Votes at synods matter but there is no equality in our church until both men and women have the same sacraments and opportunities offered to them. There is no cause to keep women from priesthood outside of basic misogyny and the distrust of women as people. Why do you believe this is not worth fighting against since you believe women deserve equality? All it would take is for thousands of priests, nuns and laity to stand together opposed to different and less treatment of women to have this pope start ordaining women priests. Demand justice! - stop asking like what you are saying is a favor not a need to uphold the human dignity of all women and all of your sisters. right on sister ! don't beg for equality, exercise it! find a sympathetic bishop and get ordained and start saying mass. Like one of my bosses used to say "don't ask for permission, ask for forgiveness"...after the fact. It strikes me as quite passive to state that they see no reason women can't vote. How about standing up in the Synod and arguing for it?